The former world junior cross country champion Andrew Sambu and another outstanding marathon runner Dickson Marwa are expected to compete at this year’s Dubai Marathon. “I will try my best to qualify for Rio De Janeiro Olympic Games “, said the 45 years old Anrew Sambu who was training hard at Arusha Stadium recently. Dubai Marathon will be held in three weeks time (January 22 2016). 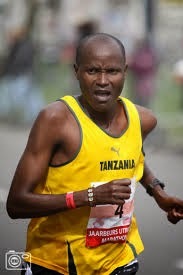 Dickson Marwa has also been training hard for the same race; the two athletes have a long history of which both have represented Tanzania at several international competitions. Tanzanians hope Sambu and Marwa will add up the number of qualifiers for 2016 Rio De Janeiro Olympic Games.